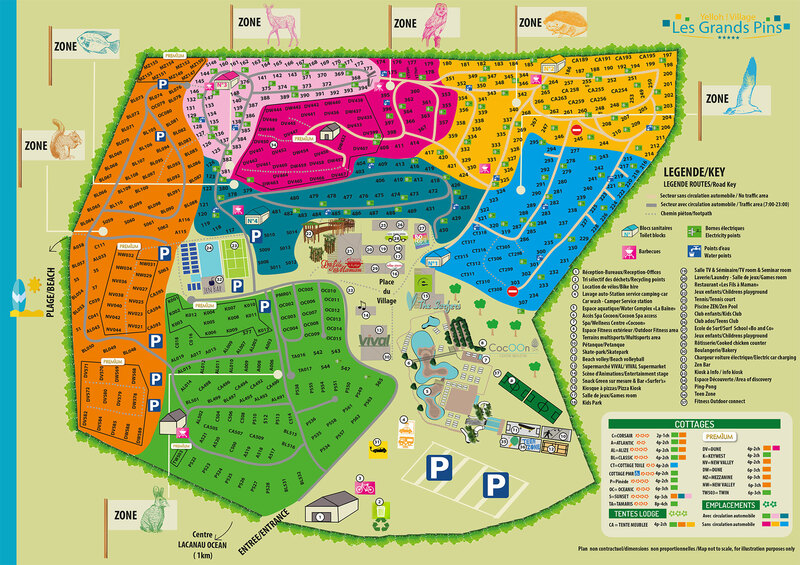 Around the village square at the camping Les Grands Pins, which is always buzzing with activity, you'll find a variety of catering options and a plethora of facilities to suit all ages and tastes! You'll love the pleasant atmosphere here and you're just sure to enjoy some great times on holiday with your family, your friends or your partner! And when it comes to catering facilities, you'll be overwhelmed by choice! From 8am, you can come and take your breakfast or a coffee on the terrace of the Surfer’s Bar. In the village square, from midday and throughout the rest of the day, our "Green sur-mesure" (made-to-measure green) concept invites you to come and enjoy a break consisting of a healthy, fresh and tailor-made meal! Foodies among you may fancy an ice cream or a home-made pancake, or why not top up those energy levels with a fresh fruit juice from the juice bar? And in the evening, you can settle back near the stage and enjoy the home-made cocktail of the day! Don't miss the Happy Hour every evening from 6 to 7pm! With its vintage decor, which spotlights all the heroes of a generation, serves simple, tasty dishes using fresh ingredients, which people of all ages will love! And in the evenings, you can come and dine here on its big terrace while you watch the sun go down! If you're looking to really make the most of your holidays at the camping Les Grands Pins, while also keeping costs down, then choose the half board option, which is just the thing for the whole family! Package must be booked before you arrive. If you're passing through the Village square, you'll notice our pizza chef preparing his pizza dough. Using fresh ingredients and with a wide range to choose from, the whole family are just bound to love these pizzas! You just won't be able to resist the lovely smell of these free range chickens, served with fresh vegetables! And to make your stay that much easier, your daily shopping spree will take you to the village square, where you'll find the VIVAL supermarket, where you'll be able to pick up everything you need, including fruit and vegetables, organic, local and fresh produce, frozen goods, wine, postcards and beach accessories! You'll also be able to make ice blocks and rent gas barbecues by the day or by the week. And beside the Vival supermarket lies the baker's, where, every morning, you'll be able to choose from a wide variety of fresh bread and pastries! Our Info Kiosk in the Village Square is stuffed full of information! Our receptionists' aim is to make your holidays even better! They'll share all their little finds with you, as well as some top tips, favourite spots and unmissable walks and outings to enjoy around Lacanau. There'll be just so much to choose from! The region really is overflowing with extraordinary natural locations and places that are famous worldwide, including Bordeaux, Cité du Vin, the Route des Châteaux du Médoc, the Bassin d’Arcachon and the Pilat sand dune. All you could need for some really lovely photos, and to come back home with lots of wonderful holiday memories!